The Vann Vocal Institute is a two-day workshop designed to encourage excellence in singing. This program brings internationally known opera singers, vocal coaches and accompanists to Montgomery to serve as faculty during the Institute, which includes intensive master classes and individual instruction for select singers, ages 16–26. Designed to encourage excellence in singing, the Institute is made possible through the bequest of Roy D. Vann and a generous grant from the NIB Foundation. This year marks the Vann Vocal Institute’s 12th Anniversary Celebration! 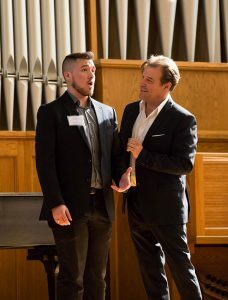 Internationally acclaimed opera star David Cangelosi, who serves as the Institute’s Artistic/Program Director, is bringing a world-renowned guest faculty of operatic artists to join him at Huntingdon College. Registration for the 2019 Vann Vocal Institute is now closed.